This weekend there was only one new major option in town, but even that option didn't seem attractive to most moviegoers as the prequel/sequel follow-up to 2012's Snow White and the Huntsman only brought in 36% of the opening weekend total of its predecessor. 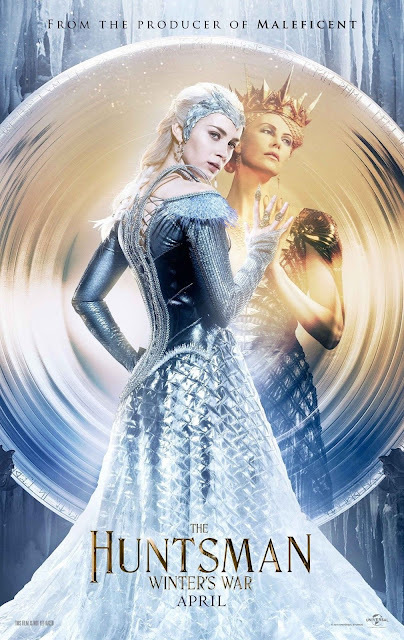 This is not without good reason as The Huntsman: Winter's War is more or less an excuse of a sequel rather than a worthy successor to the re-imagining of the Snow White story that Kristen Stewart's version aspired to be. While Chris Hemsworth obviously returned as the titular Huntsman Charlize Theron fortunately did as well in her role as Ravenna AKA the best part of the first film. Universal also stacked the cast with A-list female talent like Jessica Chastain and Emily Blunt to make up for the lack of Snow White in what is still essentially a Snow White movie, but even these women couldn't help the film in its box office debut as Winter's War came in second with an estimated $20 million whereas The Jungle Book remained in first place and far above the runner-up with a $60.8 million haul in its second weekend. That number was not only enough to win the weekend by a large margin, but in dropping only 41.1% the Jon Favreau film scored the fourth smallest second weekend drop for a film that opened over $100 million. With its domestic cume now over $191 million while taking in an additional $96 million internationally this weekend the films global take is now over $528 million or the fifth largest of the year so far. It seems the only thing that can stop Disney's The Jungle Book is Disney/Marvel's Captain America: Civil War, but that still affords the mouse house another weekend to reign before the summer movie season kicks off and with slightly different demographics The Jungle Book certainly has a shot at being extremely leggy. As always, you can hit the jump to see the full video review and be sure to subscribe to our channel for a new review every week!